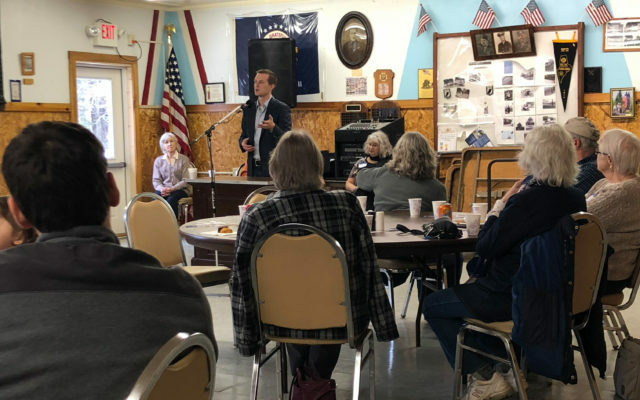 Military veteran and Assistant House Majority Leader Jared Golden, Democratic candidate for Maine’s 2nd District, visited the Island Falls VFW Hall for a spaghetti supper with area voters. ISLAND FALLS, Maine — Military veteran and Assistant House Majority Leader Jared Golden, Democratic candidate for Maine’s 2nd District, visited the Island Falls VFW Hall for a spaghetti supper with area voters. The event was hosted by Maine Attorney Pat Hunt on April 7.